Walgreens ‘front door to care’ strategy is built around multiple horizontal partnerships. There are questions about how quickly these partnerships can scale to meet investors’ concerns and how Walgreens will monetize them. 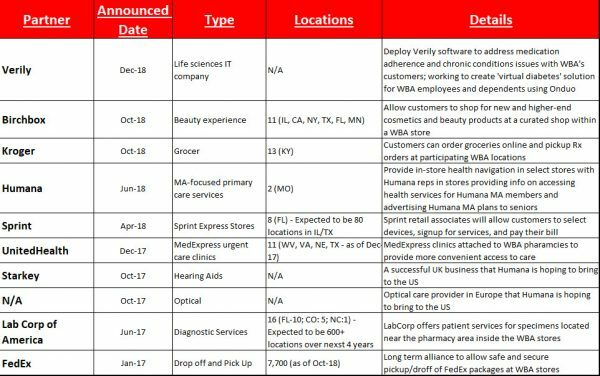 It is unclear how this new Microsoft partnership announcement fits in with the Walgreens digital consumer platform, Find Care Now, as well with the Epic EHR within Walgreens retail clinics. Last Tuesday, Microsoft and Walgreens announced a strategic partnership aimed at “transforming healthcare delivery,” including a commitment to a “multiyear research and development investment.” The partnership intends to create new care delivery models, retail innovations, next-generation health networks, integrated digital-physical experiences, and care management solutions.” Additionally, Walgreens will pilot 12 store-in-store “digital health corners” featuring “select health care-related hardware and devices” in 2019. A software-based platform for collaboration between Walgreens, payers, providers, and manufacturers. This consumer-focused platform sounds like it will be part of a larger ecosystem aimed at connecting consumers, providers, pharma manufacturers and payers supported by Microsoft’s cloud, AI and IoT technologies. Additionally, Walgreens will transition the majority of the company’s IT infrastructure to Microsoft Azure. This and other partnerships (see Figure 1) are part of a larger strategy for Walgreens to be the new ‘front door to care’–bringing healthcare to where patients and customers want to receive it. Walgreens can make it easier for patients to access care since 75% of the United States population is within 10 minutes of a Walgreens. The question now is whether Walgreens can scale its various partnerships quickly enough to contribute to satisfy investors or to attract payers and employers looking to drive cost savings. Each partnership is different in terms of complexity and will scale at its own pace (see Figure 1). Some will begin to show more immediate results and some will require multiple years to be successful. Here are some of the key observations and unanswered question about the most recent announcement. How Quickly Will These Partnerships Scale? At the J.P. Morgan Health conference, management stated it has all of the healthcare services that Walgreens needs at this point through the various partnerships it formed over the past 18 months. The question is how quickly Walgreens can execute on them. Walgreens management stated the partnership with Humana has gone well, but it is still very early days, and the company can’t make projections about the scope of the rollout beyond the initial 2 locations in the Kansas City area. However, the positive results of the LabCorp partnership mean that it will expand to 600 stores over the next few years. While customers may already see benefits from these partnerships, whether investors will have the patience to allow these partnerships to mature is an open question. Management has been under pressure to explain how these various partnerships will contribute to the companies’ financial performance. Where Does Find Care Now Fit? Walgreens announced a new digital consumer platform, Find Care Now, last July to help consumers connect to an array of services offered by its provider partners, Walgreens-owned health services, and third-party providers including telehealth services (MDLive and DermatologistOnCall) and on-demand doctor house calls (Heal), where available. Find Care Now will be hosted on Microsoft Azure with plans to enhance it with chronic disease management and more patient engagement apps. Whether the apps developed with Verily will be included is unclear. Walgreens plans to develop a separate B2B platform with Microsoft with services for payers and device manufacturers. What Role Will Epic Play? The overwhelming majority of Walgreens’ 370+ retail health clinics use Epic’s EHR. Announced in Nov. 2015, the rollout was fully completed in March 2017. Walgreens announced 14 new partnerships with healthcare systems, such as Advocate Health Care in Chicago and Swedish Medical Center in Seattle, in which the health system operates clinics inside Walgreens retail stores. These health systems hire the providers, oversee patient care, and bring in their own EHRs. The question is how, and more important if, Verily and Microsoft might work together with Epic to find synergies from the solutions each is creating with Walgreens. Walgreens has a different strategy to its ‘front door to care’ model compared to Aetna-CVS and Walmart which relies upon a multiple ‘horizontal partnerships.’ The question now is whether Walgreens can scale its various partnerships, especially with Humana, quickly enough to contribute to satisfy investors looking for better financial performance or to attract payers and employers looking to drive cost savings.